Sega Flash Vol. 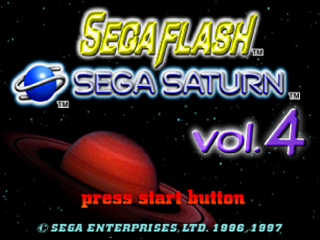 4 is the fourth demo disc in the Sega Flash series. It was released in 1997. Vol. 4 contains three playable demos, however Cyber Troopers Virtual-On is recycled from Sega Flash Vol. 3. Die Hard Arcade contains the first section of the first stage and Sonic 3D: Flickies' Island contains the first level too (and bonus stages). The videos are full-screen and are again no-frills demonstrations of gameplay footage. There is an additional "arcade titles" video which shows Model 2/Model 3 footage of Last Bronx, Sega Touring Car Championship and Virtua Fighter 3, all considered big Sega arcade games at the time. In the United Kingdom this was released with issue #19 of Sega Saturn Magazine.